Lady Gaga: You Lost me on this one. 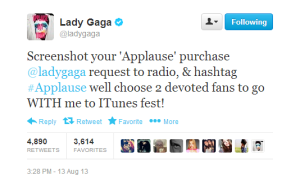 Lady Gaga’s new single “applause” came out this week to much fanfare, and all that fanfare coming from Lady Gaga herself. I was obsessed with all things Gaga a few years ago, but she really just missed the mark on this song, honestly. It’s not that catchy, it’s not an earworm, it doesn’t necessarily make you want to get up and Just Dance really. 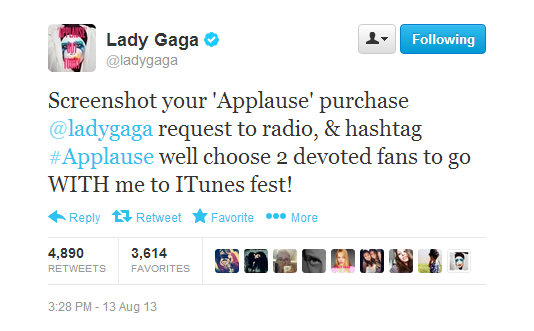 I have a feeling Applause and this whole album ARTPOP is going to be one big ego-stroking flop. Absence does not always make the heart grow fonder. In this case, Gaga’s prolonged absence from the new-music charts has made her shtick old hat.